In honor of Black History Month this Februrary I wanted to highlight a few African American Interior Designers that I admire. They have impressive, accomplished careers and are making an impact on the design scene. I am featuring these three women because I have come across their work previously through an article, podcast, or some other form of media that I found inspiring and left an impression. I wish I had gotten this post out sooner for the duration of the month, but it's always a good time acknowledge the inspiring work of hard working designers! So here goes! I wish I could actually remember the first time I came across Sheila's information, it was quite a few years back, but I'm pretty sure it had to do with her book "Furnishing Forward." 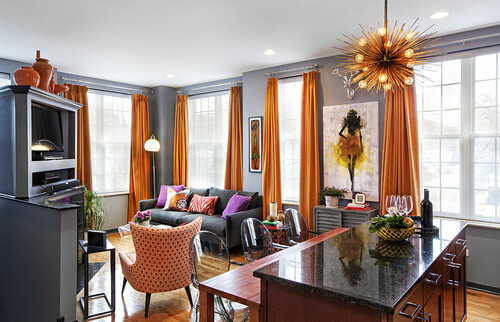 I think Sheila is such a design icon, she has a well developed classic style with rich art incorporated into each room. I love her living room! These soft blues and red are a great combination! All of these photos are from Sheila's website, you should click your way there to read more, and see more of her beautiful work including her Harlem Toile! I loved Tiffany's story from winning an HGTV competition, to having her own show and design business. I LOVE that she self educated to get up to speed in the industry and that her career has evolved oraganically. I also remember her honesty during the interview when she discusses the pains of being the "cobbler's kid" - meaning it can be challenging for designers to actually design their own homes! And honestly - I feel that too! Take a look at some of Tiffany's rooms below! Love the pops of orange & warm wood tone against a gray backdrop . 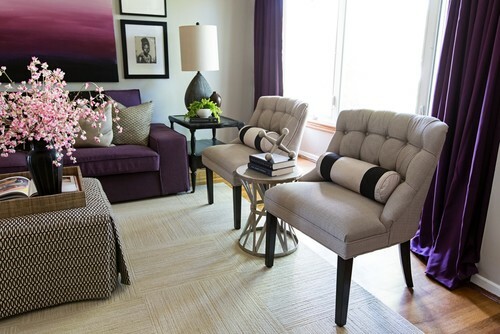 Love the pinks and purple - the artwork really ties this room together. Another introduction through the the Million Dollar Decorating podcast! * Nicole is the author of fantastic blog "So Haute Style" and has also been featured in many magazines and has a show called "Home Made Simple" on OWN. Take a look at some of Nicole's design work below! What I love about Nicole's design style is that it is "just enough" - channeling the famous Chanel quote "before you leave the house, look in the mirror and remove one accessory." Her rooms are so refined and classic, there really isn't anything extraneous in the rooms yet they are full of personality! I hope you enjoyed this month's designer feature filled with lots of beauty & inspiration! I invite you to sign up for my free monthly email newsletter by clicking here! !